British production sound mixer utilizes Portable Digital Audio Recorder and Digital Hybrid Wireless for latest installment of the spy thriller franchise. 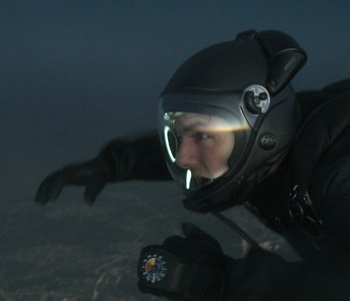 Tom Cruise, who performs many of his own stunts, doubles down on the daring in Mission: Impossible – Fallout, the latest installment of the spy thriller franchise. 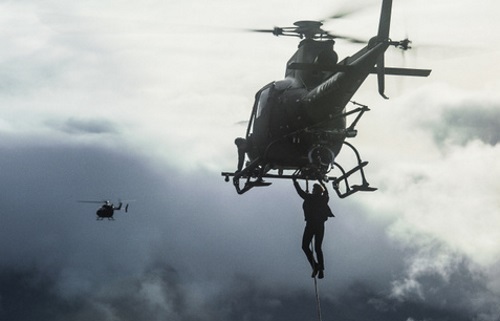 British production sound mixer Chris Munro had to up his game to cleanly capture Cruise’s dialogue as the action star clambered aboard a moving helicopter, leaped from a high-altitude jet and sped through the streets of Paris, using Lectrosonics PDR Portable Digital Audio Recorders, as well as his existing arsenal of Lectrosonics Digital Hybrid Wireless equipment. The best intentions often come back to haunt you. Mission: Impossible – Fallout finds Ethan Hunt (Tom Cruise) and his IMF team (Alec Baldwin, Simon Pegg, Ving Rhames) along with some familiar allies (Rebecca Ferguson, Michelle Monaghan) in a race against time after a mission gone wrong. Henry Cavill, Angela Bassett, and Vanessa Kirby also join the cast with filmmaker Christopher McQuarrie returning to the helm. Mission: Impossible – Fallout opened in RealD 3D and IMAX on July 27th, 2018. 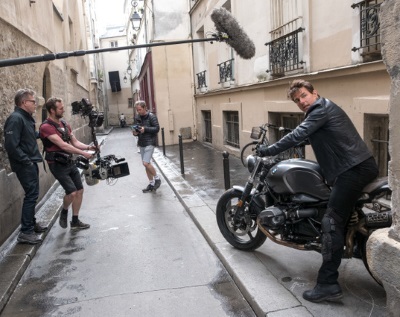 Director Christopher McQuarrie, B camera/steadicam operator Marcus Pohlus and Tom Cruise (right) on the set of Mission: Impossible – Fallout, from Paramount Pictures and Skydance. The Lectrosonics SMV transmitter is located next to the wind-protected shotgun microphone. “I used Lectrosonics on M:I – Fallout because of the range that could be achieved during the challenging car chase and helicopter sequences,” says Munro, who relied on SMb transmitter belt packs for this production. For those situations where it was impractical to use wireless mics, including the skydiving sequences and some of the helicopter sequences, Munro used Lectrosonics’ PDR, a device the size of a small body pack that captures 24-bit, 48 kHz digital audio onto a Micro SD card with synchronized internal or jammed external timecode. HALO or High Altitude Low Opening is a military technique that minimizes the time a parachutist spends in the air, free-falling at terminal velocity for a period before opening the parachute as low as 2,000 feet above the ground. For the film, Cruise jumped from a Boeing C-17 transport jet flying at 25,000 feet. Munro got his start in production sound in the early seventies and has been using Lectrosonics since his first film project in the United States. He didn’t own any Lectrosonics equipment until the mid-nineties, when the company introduced versions that operated in Europe’s radio frequency spectrum. Munro has worked on more than 80 films, winning Oscars for Gravity (2013), for which he also won a BAFTA, and Black Hawk Down (2001). He has also been recognized with multiple awards and nominations for his work on Wonder Woman (2017), Captain Phillips (2013), Quantum of Solace (2008), Casino Royale (2006), United 93 (2006) and numerous other films.